March 17 is a big day in Florida Gators athletics for three reasons: the basketball team is preparing for first-round action in the 2010 NCAA Tournament against the Brigham Young Cougars, the football team begins spring practice for the 2010 season and more than 15 former Gators football players who have declared for the 2010 NFL Draft will work out and perform in front of representatives of each NFL team during Pro Scout Day at Ben Hill Griffin Stadium. As two of his National Championship titles and his Heisman Trophy sign hang on the stadium’s walls, Tebow will be on Florida Field proving to NFL coaches, scouts and personnel that his tweaked mechanics, throwing motion and release are improved enough where he can be considered for selection with a first- or second-round pick. Millions of dollars are on the line for Tebow, who was initially given a third-round grade. Tebow’s stock has steadily improved over the last few weeks after an impressive showing at the 2010 NFL Scouting Combine coupled with a dedication to “fixing” his release. He is now projected to go in the second round, though there are inklings that a few teams may be interested in trading up into the bottom of the first to pick perhaps the most accomplished quarterback in college football history. Will it be the Buffalo Bills? New head coach Chan Gailey, a former Florida quarterback, loves developing young signal-callers. 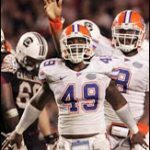 Could the Jacksonville Jaguars realize Tebow’s value, trading up to select the hometown star who can be the new face of a franchise that is in dire need of a face-lift? Perhaps an established powerhouse like the New England Patriots, Indianapolis Colts or Minnesota Vikings pulls the trigger for Tebow as a future starter? Humans are emotional by nature, and emotions can be swayed by, literally, a flick of the wrist. Forget a score of 22 on the Wonderlic or his other “flaws,” Tebow has an opportunity to quiet his doubters and enliven his believers with his workout Wednesday – perhaps the most important of his career. He has said on multiple occasions that he will do anything he is asked to do in order to prove to NFL teams that he can play quarterback, so expect coaches to throw some routes at him other than what is scripted by Tebow and his receivers. Whether he impresses or fails to do so, Tebow’s next step will be private workouts with any interested teams. A few are already scheduled, but one can be sure that his appointment book will get quite full if teams become enamored with what Tebow has been able to do mechanics-wise in such a short period of time. The Swamp will be open for Pro Day beginning at 8:30 a.m., though the on-field portion of the event will not start until 10 a.m. Fans will be allowed to enter via Gate 2. As first reported by OGGOA, restrooms and concession stands will be open. Video cameras, food/drink containers, bottles, cans and a variety of other items are prohibited. Ill be out there tailgating at 6:30. burgers, ice cold brew/ bloddy mary’s……who am I kidding, Ill be in meetings all day. The “smart” play for any team, and the best scenario for Tim, would be to draft him as a future starter behind a well developed QB. Before the combine I did not think he had a chance as a starting NFL QB. But his combine performance, coupled with all of his “intangibles”, leads me to believe that he has as good a chance as any of the other QB’s in the draft to one day be a successful NFL QB. The key is to get him into a situation where he can learn from a veteran QB in an established system. If he ends up in Jacksonville or Buffalo his career will be over before it even starts. If he finds his way to the Colts or Patriots, I think we will see him play on Sundays. The bottom line is that he is not ready right now to start in the NFL at QB. Sarasota – I completely agree with you. The best-case scenario is for him to be a back-up for a few years behind a star NFL QB (ala Aaron Rodgers). I’ll head on over there to take a look at him first hand….bad luck though for Tim, 60% chance of rain tomorrow. Will it affect the performance? We’ll have to see, hopefully not.